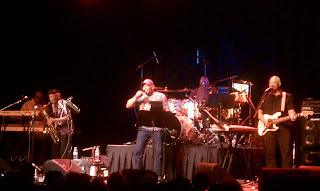 Eventcraft recently had the pleasure of working working with Aaron Neville at the Ponte Vedra Concert Hall. I've worked with Aaron Neville several times and on separate occasions with other members of the Neville family including the family as a whole who perform as The Neville Brothers. The Nevilles have a rich history in music and like many great family bands most of the members have their own side projects. Aaron's son Ivan Neville has his own band called Dumpstaphunk, a funk group based out of New Orleans who has become very popular in the festival scene here in Florida and throughout the United States. Ivan has many credits in his career most notably he recorded and toured with Keith Richards for Keith's solo album "Talk Is Cheap", he recorded with Bonnie Raitt, G'ovt Mule and John Mayer just to name a few. The original Neville Brothers idea formed when Art, Aaron, Cyril and Charles got together with their uncle Big Chief Jolly and did some recording with one of my favorite New Orleans Mardi Gras Indian bands The Wild Tchoupitoulas. That's another story all together so let's move onto the gear behind the sound of some of the touring Neville family. On your left Keyboards. We provided a Yamaha Motif ES8, Yamaha Motif ES7 and a Korg Triton Pro. Saxophone: Artists almost always carry their own horns as is the case here but often times they need to us to supply a wireless microphone systems specially designed for horns. Eventcraft provides these wireless sax microphones and the most common one is the Shure Beta 98 HC. Drums: DW Collectors Series with Zildjian Cymbals. Eventcaft stocks a healthy inventory of Drum Sets and Cymbals for rent. Bass Guitar: He's playing an Ampeg SVT Classic through 2 Hartke 4X10 Cabinets. A bit unconventional but he got a great sound. You can see more of the bass rigs we offer on our equipment page. (not pictured) Guitar: He used a Fender Hot Rod Deville. They're great amps and we offer them in several different speaker configurations. Dave Mason is also a big fan of the Fender Hot Rod series. When we worked with Ivan Neville's Dumpstaphunk back in April his band had a pretty cool setup of backline that Eventcraft provided. 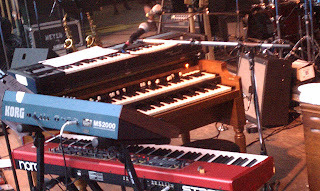 Check out this picture I took of Ivan's keyboard setup from the show. He's using a Korg MS 2000 for bass synth, a Nord Stage for electric piano sounds, a Honer Clavinet E7 for it's one of a kind funky string sounds and Eventcraft's #1 Hammond B3 Organ. Eventcraft has one of the best Hammond B3s in Florida. Check out our special page dedicated to our Hammond B3 and see what people are saying about it. Part of what makes Dumpstaphunk unique is they have 2 bass players so in turn they need 2 bass rigs. Nick Daniels used a SWR SM 900 bass amplifier with (2) SWR Goliath III 4X10 Cabinets and the amazing Tony Hall played a David Eden WT 800 bass amplifier with (2) David Eden XLT 4X10 Cabinets. Ian Neville plays guitar in the band and he used a Fender Hot Rod Deville. Nikki Glaspie played our Yamaha Recording Custom Drum Kit and she used Zildjian Cymbals.